THE JUSTICE MINISTER Alan Shatter has offered an olive branch to solicitors and barristers, promising to abandon plans which would see him gain the power to control the proposed new regulator for legal services. Shatter said this afternoon that legislation to set up the regulator, which has not been touched in the Oireachtas for 15 months, would be amended to “copper-fasten” the independence of the body by ensuring that appointments were made through nominating bodies. The legislation has been heavily criticised, in its current format, for giving lay people a majority of seats on the new regulator’s 11-member board – with the power of appointing those lay members resting with the minister. Both barristers and solicitors said the legislation meant their respective professional societies – the Bar Council and the Law Society – would be sidelined, and overruled by a body whose membership was effectively controlled by the minister of the day. Speaking at the Law Society’s Annual Conference in Co Kerry today, however, Shatter said he would bring amendments to the legislation to ensure that appointment of members lay with nominating bodies – removing his effective right to appoint a majority of members. “In a similar vein, I will be enhancing the modalities of appointment of members of the Complaints Committee and of the Legal Practitioners’ Disciplinary Tribunal,” he said, also adding that the members’ four-year terms would be staggered in order to minimise the possibility of political interference. The legislation passed its first Dáil vote in February 2012, but has not progressed to committee stage since then. Shatter said this stage – the first at which amendments can be made – would now be held in July. Separately, Shatter questioned the merit of a court recess for the entire months of August and September, pointing out that the sustained recess seemed lengthy in the modern world – particularly with the higher courts facing a significant workload. “I hope I will not be misunderstood and there will not be a suggestion of some new controversy if I merely raise the question,” the minister asked, welcoming the recent announcement that a number of High Court judges would be sitting during September to help hear some cases. Shatter also announced that the government had agreed to a constitutional amendment safeguarding the tenure of judges if the Seanad were to be abolished. Currently the impeachment of judges requires a majority in both houses – meaning that, if the Seanad were to disappear, a majority of TDs could have a judge removed from office. Shatter said this would be adjusted so that a two-thirds majority would be needed in future, assuming that the proposal to abolish the Seanad is approved in a referendum later this year. 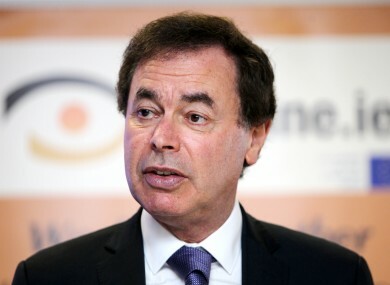 Email “Shatter offers olive branch to lawyers over appointment of new regulators”. Feedback on “Shatter offers olive branch to lawyers over appointment of new regulators”.